Why Time Sensitive Networking (TSN)? Since Ethernet was standardized in 1983, it has evolved both from the technical and from the application point-of-view as well. The original use for computer networks has been extended to be the de-facto Data Link protocol for field-buses in Industry (Profinet, Ethernet IP, Ethercat, Sercos III, etc. ), Aerospace (AFDX), Energy (IEC 61850 over HSR/PRP), Automotive (Deterministic Ethernet) and Transportation. Most of the applications in these critical sectors require Real-Time operation. This requirement makes it necessary to ensure the reception of specific data within a strict time frame, defined by the criticism of the process. The conventional Ethernet cannot ensure this deterministic operation. Therefore, during the last 30 years, the vendors of Industrial Communications solutions have implemented different protocols and enhancements for Ethernet. The result has been a plethora of non-interoperable Ethernet based alternatives. The Industry 4.0 paradigm, based on the massive interconnection of Cyber Physical Systems combined with a Big Data analysis, has highlighted this well-known challenge of mixing Operational Technologies (OT) with Information Technologies (IT). Therefore, a common Ethernet technology able to merge OT and IT worlds would be an outstanding forward step to really ensure interoperability and standardization. An effective development of these technologies shall offer a significant cost reduction in equipment, maintenance, seamless integration of advanced analysis services and a reduction of dependence on a single vendor. Time Sensitive Networking (TSN) is a comprehensive proposal for a unique Ethernet based solution. A significant success in merging critical and best effort traffic in a single media was achieved by Audio Video Bridging (AVB) initiative. Indeed, some of their technical solutions were seen as valuable alternatives to other sectors. As a result, the original AVB working group evolved to IEEE Time-Sensitive Networking (TSN) Task Group, which is in charge of developing the standards related to TSN. These standards propose enhancements for IEEE 802.3 networks in order to define a unique Ethernet based solution for OT and IT. The fundamental base in TSN is the Time-Aware Shaper. It is designed to separate the communication on the Ethernet network into fixed length, repeating time cycles. These cycles are divided into time-slots according to the TSN configuration agreed between peers. The different time slots can be configured and can be assigned to one or several of the eight Ethernet priorities. The operation of the Time-Aware Shaper is defined in IEEE 802.1Qbv. The Time Aware Shaper allows defining the number of time slots available in each cycle, their duration and which priorities can be transmitted. Thanks to this mode of operation, the Scheduled Traffic has dedicated time slots to ensure the expected deterministic behavioral. The best-effort traffic is accommodated in the remaining time-slots of each cycle of operation. An important improvement for the priorization and bandwidth use optimization in TSN is the support of Credit Based Shaper, as defined in IEEE 802.1Qav. This functionality allows using Reserved Traffic type, upgrading the priority of designed traffic in a state between the Scheduled Traffic and the Best-effort one. The technical challenge of providing nanosecond range synchronization accuracy among the TSN devices that compose the network is faced using IEEE 1588 timing synchronization protocol. Thanks to the accuracy provided by this technology, it is feasible ensuring controlled network delay and jitter implanting effective time-triggered Ethernet based solution. The specific IEEE 1588 profile for TSN is named IEEE 1588ASrev. 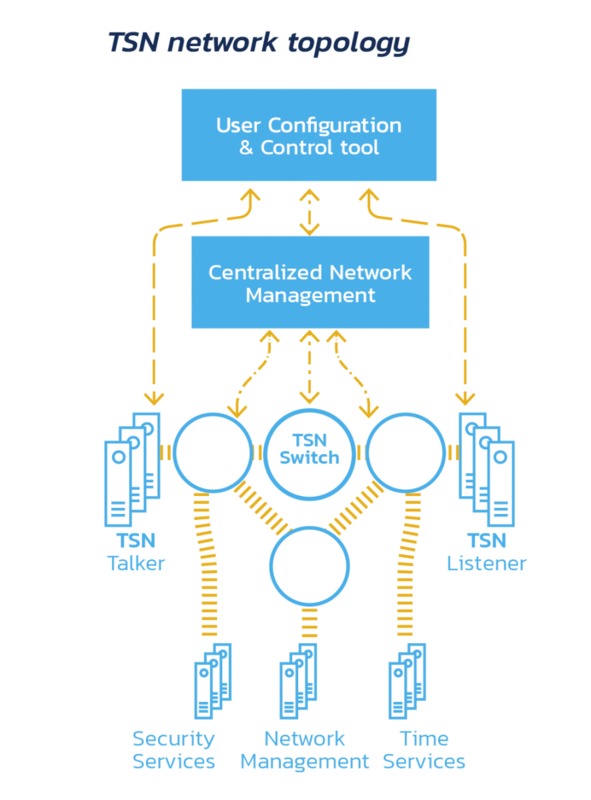 The configuration plane of a TSN Network (see Figure 1) is one of the most active topics in the standardization (IEEE) and Industrial (IIC TSN Testbed Working Groups) groups. TSN communications are based on a data streams set between a Talker and a Receiver. Based on the agreed parameters for each Stream, it is necessary to configure all the elements of the TSN network to switch the frames based on the selected parameters. This operation is performed by a Centralized Network Configuration (CNC) node. This CNC shall be able to talk to the equipment of different vendors in a standardized way. The early advances in this field are based on IEEE 802.1Qcc standard. As it can be depicted from this introduction, TSN is not a single standard. Instead, it is a group of standards that are evolving at a different pace. Furthermore, many of them are still draft versions and probably, its evolution will depend on the real demand of these specific features from the market. The following list summarizes the most relevant standards involved in TSN: 802.1ASrev Timing and synchronization (currently, 802.1AS is used in most TSN implementations); 802.1Qbv Time-aware shaping; 802.1Qcc Stream Reservation Protocol Enhancements and Performance Improvements; 802.1Qci Per-stream filtering and policing; 802.1CB Redundancy; 802.1Qbu Frame pre-emption and 802.1Qch Cyclic queuing and forwarding. How should I introduce TSN in my network equipment? Attending the figures and information given by the Economic Analysts, the TSN market is expected to be worth USD 606.0 Million by 2024, considering that it will get commercialized by 2019. This year, the first TSN capable end-equipment will be available in the Market, like CISCO IE-4000 or some National Instruments modules. However, any company that forecast introducing TSN in their infrastructures it can start retrofitting their current servers and network equipments using comprehensive hardware and software TSN solutions. All TSN equipment will have an active role in the network. Therefore, a first approach to TSN able to abstract current customer applications and devices from this complexity will help moving forward to this deterministic Ethernet technology. RELYUM is a leading technology provider for Time-aware Ethernet based (IEEE1588, HSR/PRP, etc.) devices. Its products have been served to run mission-critical projects in Europe, America and Asia. Thanks to this accumulated experience, RELYUM has developed an innovative TSN solution thought to allows a seamless integration of TSN capabilities on standard networking and computing equipment. 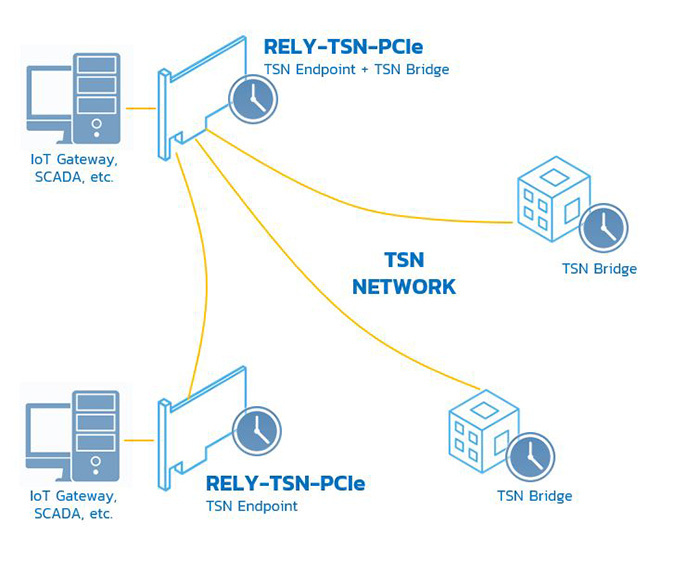 RELYUM’s TSN solution is called RELY-TSN-PCIe (see Figure 2). RELY-TSN-PCIe is the first out-of-the-box solution for TSN that allows seamless implementation of deterministic Ethernet networks and abstract user equipment and applications from these technical complexities. 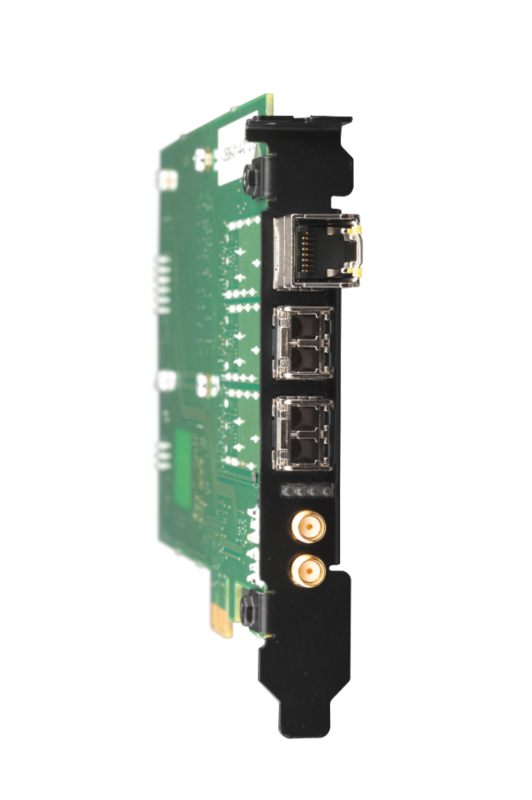 This device combines in a single equipment PCIe TSN Endpoint and TSN Bridge functionalities and provides 3 external fiber optic or copper media tri-speed Ethernet ports (see Figure 3). These powerful platforms offer combined hardware and software processing capabilities and they ensure upgradeability of the solution thanks to their reconfigurable nature. This last advantage is a key point for TSN implementations, taking into account that the standard is evolving, the ability to upgrade the equipment will be compulsory. TSN offers network convergence and will enable effective implementations of Industrial Internet-of-the-Things set-ups. Several important companies are pushing the development of solutions and the development of the standards. However, realistic TSN networks will require TSN-aware equipment from all vendors. RELYUM proposes an accessible and complete approach to all the system integrators who want to offer in their solutions TSN capabilities and decide to catch this unbroken wave. Relyum is born to provide innovative solutions for networking, synchronization and cybersecurity in critical systems. This goal is achieved through industrial products which integrate time-aware reliable communications, embedded computing, sensor data acquisition and security capabilities in the same device.